So, I cut my nails off. Sometimes I get tired of dealing with long nails. They're high maintenance! And cutting them off is pretty liberating. It's kind of like getting new nails. That sounds weird. Hopefully it makes sense though. I bought some polish from Etsy not too long ago. I was browsing and hoping to find something unique and fun. Boy did I ever!! I found Amy's Nail Boutique. She has some really cute polish and I highly recommend her store. I got a notice my package was shipping in only 15 mintes after my purchase. How's that for customer service. Wow!! Since I am so in love with my new polishes, I'm going to do something I don't normally do. I'm gonna blog three polishes in one post. I like my blog to be my diary of what I wore for the day, but I cannot wait for these! So here they are. 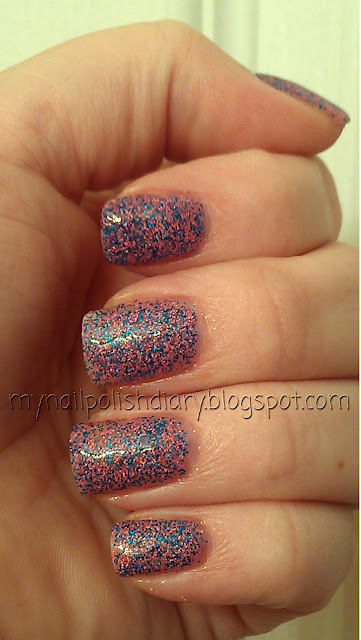 Amy's Nail Boutique Cotton Candy is from her Matte All The Nails Collection. 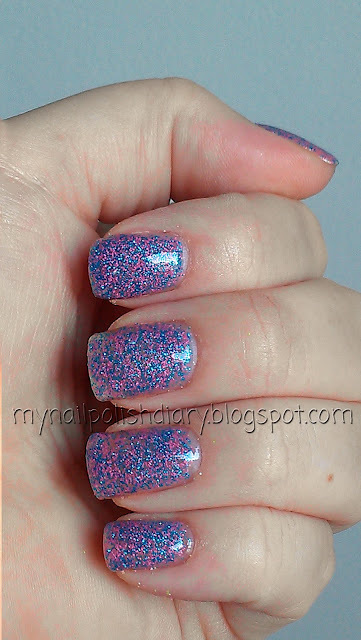 It's pink and blue matte glitter and it's so pretty. I love it! Absolutely love it. This is 3 coats with no underwear. I wanted to see it as it is without anything to interfere so I chose no underwear on all three polishes. It dries kind of semi matte so I added SV. I really wanted shiny. 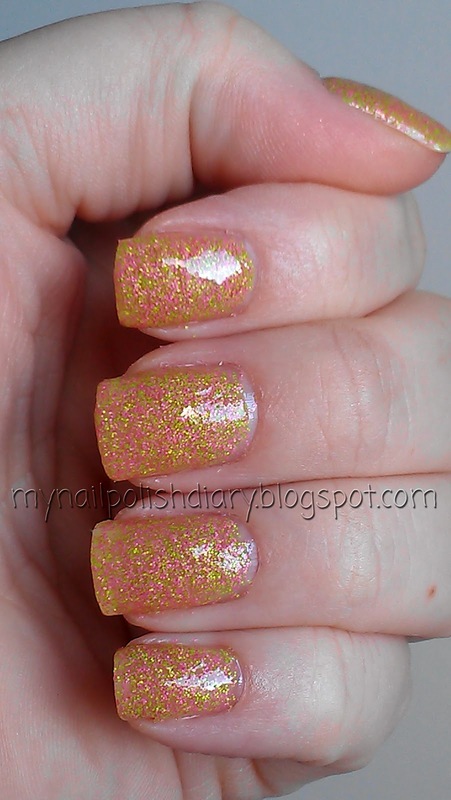 I love this type of glitter. Amy's Nail Boutique Preppy is also from her Matte All The Nails Collection. It's a pink and green matte glitter. Isn't it pretty! I love this combo. I don't know that I am personally preppy, but my nails sure are ;) This is three coats with SV again for the shiny. Amy's Nail Boutique Roxy is the last polish I got and is from Matte All The Nails like the other two. 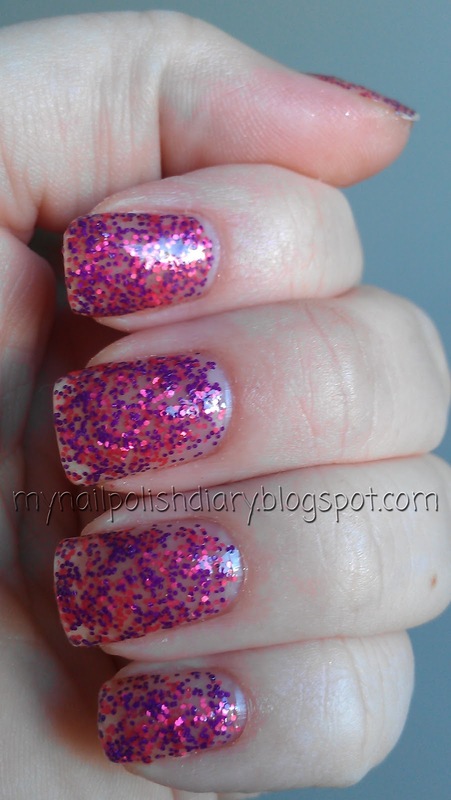 It's pink and purple matte glitter. Looking at these pictures I can be sure when I wear this I will do either underwear or four coats. It didn't cover the same with three as the previous two. Even tho it seems to cover less I really like it. The pink is so bright! All three of these polishes are just beautiful. I really, really like them. I'd buy them again in a heartbeat. And you should too! You will be glad you did. The polish applies really easily. You don't have to fish around or place the glitter at all. On the first coat you will see the glitter spreads out nicely. It's builds just perfectly. I think it will look good either alone or with underwear. I don't think you can wrong here. I will add though, you'll probably want two coats of top coat. I noticed it's still a little lumpy with just one. I will use Gelous and then Seche Vite when I wear these again. It's pretty typical for glitters to need two coats and I knew I'd probably need the two coats, but for swatching purposes I just went with the one. Tami, these look sooo fun! Your "new" nails look great, too. :) And how fun, an Etsy shopping spree. Thanks Liesl. I think I'm going to have to limit my time on Etsy. There are so many fun things to buy!! !